Film adaptation of the famous comic book franchise follows newspaper publisher Britt Reid as he becomes the titular crimefighting superhero. Britt Reid, the aloof and disengaged son of a powerful Los Angeles newspaper publisher, changes his ways and decides to become more serious about his life after his father dies from a bee sting. 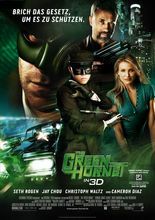 Upon being convinced by one of his father's old assistants to begin playing the part of a deed-doing wunderkind following a drunken romp one night, Reid assumes the personality of the Green Hornet, a superhero designed to fight crime whilst attracting new readers and customers to his media operation.